SPEARFISH, S.D. — College football is back. Well, sort of. Black Hills State University wrapped up its spring football practices on Saturday with its annual spring game at Lyle Hare Stadium. Fans had a chance to watch as the Green team claimed a 12-10 victory over the White team. 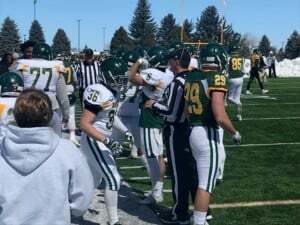 BHSU football players gear up to compete in the annual spring game. Offensively, the spring practices were an open competition as to who will take over the reins at quarterback in an attempt to replace Ryan Hommel. Right now, three players are vying for the position including Tyler Hammons, Riley Glynn and Chance Eben. The Yellow Jackets open the football season on Saturday, September 7 at home against Chadron State College.